According to Article 4.4.2 of the official basketball rules, players are only allowed to wear headbands no wider than five centimetres. 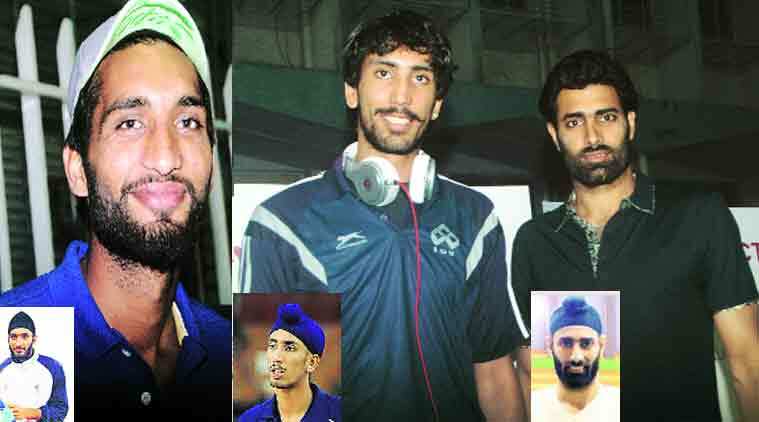 Amritpal Singh, Amjyot Singh and Yadwinder Singh, all of them had to chop their hairs to play the sport. Players from Indian basketball’s powerhouse, Punjab, had a miserable outing at the recently concluded national championships in Bhilwara, getting ousted in the quarter-finals. But concerns over the state’s downward spiral run deeper than shooting lapses and rebounding errors. The international ruling that bars Sikh players from wearing a patka is dissuading many youngsters from joining the sport in which Punjab has excelled over other states. “If my son wants to play basketball in the future, I will never let him get into the game,” says Amjyot Singh, who plays for India at the international level. Though not a father yet, he says that the past year, during which the ruling was enforced, has strengthened his resolve. At the Savio Cup in Mumbai on Monday, Amjyot, who also plays for Chennai’s Indian Overseas Bank, shook his head as his state juniors were defeated by Maharashtra. Two days before the Asian Games in September, Amjyot, along with India teammate Amritpal Singh, tiptoed into a salon in Noida and asked for a short crop. It was a heartbreaking moment, says Amjyot, who had grown up with a patka. A ruling enforced by FIBA — the international governing body for basketball — during the Asia Cup in June last year declared that the “headgear” posed a threat to opponents. It meant India’s top two youngsters — out of the starting five — needed to get rid of their patka or sit out. According to Article 4.4.2 of the official basketball rules, players are only allowed to wear headbands no wider than five centimetres to hold back hair and sweat. “They don’t understand it’s not just a headgear. It’s a part of my body,” Amjyot says, adding that the rationale given to them — that someone could hide a dangerous weapon inside a turban — makes no sense to him at all. “Indians have played with patkas all these years and nothing untoward has happened. In fact, the first time we played at Wuhan for an Asian Championship in 2011, I played with a patka. It was the same place where we were told to sit out later,” he recalls. “We warmed up and suddenly we were asked to step out,” Amritpal recalls. “I come from a poor farming family in Amritsar and I’m the only earning member. I saw my father’s helplessness when I told him that I’d need to chop my hair. He was shocked, but he had no choice but to allow me,” he adds. For fellow India international Yadwinder Singh, it was a shock they’ve not fully recovered from. “Our most tall and well-built players who play in key positions have traditionally come from Punjab. But people don’t understand it is not just any other religious symbol; a patka is a part of us,” says Yadwinder. Amjyot believes his generation of players are caught in the middle. “People know us because of basketball. It gives us jobs and brings food to the table. The game is everything for us. But the sport will lose many talented players from Punjab if they don’t rethink this rule,” he says. “The first time we were told, I felt very sad. It was like a part of body was gone… My father also played basketball and he told me to quickly finish my playing years,” he adds. Meanwhile in Mumbai, Jaspreet Singh (20) is one of only two patka-wearing players on the court when Punjab lose to Maharashtra. Though the rule is not enforced in India, the youngster insists that the ruling is against religion. “No one has ever been hurt because a Sikh player wore a patka, but they think we’ll hide weapons. If seniors were compelled to cut their hair to play, then it’s bad for us juniors because even we’ll have to make a decision. I’ll not cut my hair if it comes down to choosing,” he insists.